RJS Inspector D4000 - Auto Optic (3,6,10,20 mil) - North America. Ideal for customers needing FULL ISO/ANSI barcode quality testing in North America. The Inspector D4000 Auto Optic and Laser incorporating an Auto-Optic scanner is the industry's most flexible ANSI method verifier. The Inspector D4000 Auto Optic and Laser incorporating an Auto-Optic scanner is the industry's most flexible ANSI method verifier. Eight optical arrangements are possible via menu selections for four aperture sizes and two wavelengths of light. The optical geometry meets all requirements of the ANSI X3.182 Barcode Quality Guideline. 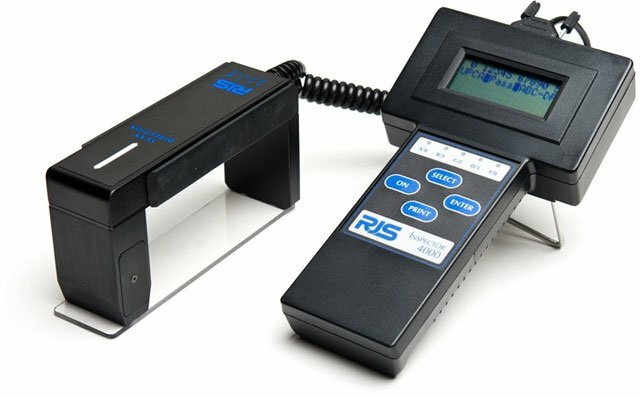 The Auto-Optic scanner is designed and manufactured by RJS for the sole purpose of performing ANSI method barcode quality analysis. Repeatability between units is outstanding, making the Inspector D4000 Auto Optic and Laser an ideal choice as a standardized company-wide ANSI method verifier. VCIR USB to RS-232 Serial Adapter. Adapter for the VCIR software if RS-232 serial port is not available on PC. VCIR Inspector Series PC Interface Software Kit RS-232. For customers requiring printed inspection reports, printed scan reflectance profile charts, Excel spreadsheet job reports REQUIRES access to a PC computer with RS-232 Serial Port. Rechargeable Batteries (4). NiCad rechargeable batteries for the D4000, I-4000 and L-1000. TP140A Printer (with cable & paper, 110V). For customers requiring printed reports for the barcodes inspected. Direct thermal inspection report printer with 4 inch wide paper. The RJS 002-7850 is also known as 002-7850	or 0027850	.